The shock referendum announcement by Alexis Tsipras over the Troika’s austerity demands has radically increased the chance that Greece will fall out of the eurozone. I am surprised that the markets, and indeed the Greek people themselves, did not give more credence to this outcome over the last few weeks. The received wisdom of most market pundits is that an 11th hour agreement would be reached. Meanwhile, Greeks have been pulling money out their banks, but at a very leisurely pace. To me, this nonchalance appears bizarre. 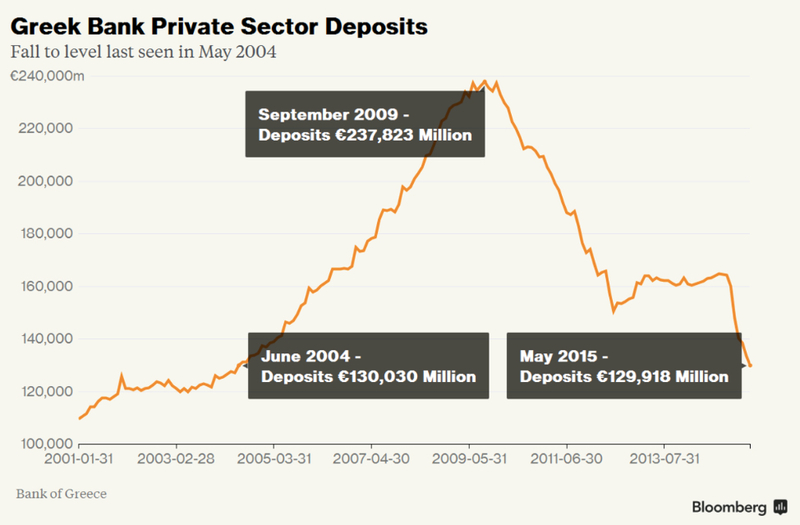 The chart below shows Greek bank private-sector deposits falling from 160 billion euro prior to Syriza’s election victory to around 130 billion euro at end May. The chart is made to look more spectacular by having the y-axis commence at 100 billion euro. Even if last week you had only assigned a 5% probability to a return to the drachma, such an outcome would result in a 30-50% decline in the value of your savings when denominated in euro. Risk equals probability times effect. The probability might have been assessed—wrongly as it turns out—as small, but the impact should have been deemed as large. The prudent man or woman would have parked their money abroad until a deal was sealed and then repatriated the money once confidence was restored. And for small accounts that couldn’t justify the hassle and fees of an inter-country transfer, you could always stash cash under the bed. Yet relatively few have followed such a simple risk control strategy (Chart from Bloomberg here). At this point, it appears improbable that the banks will open on Monday, and the Greek authorities will have to introduce capital controls and bank deposit withdrawal limits. If this is indeed the case, the likelihood of avoiding a return to the drachma looks remote. Very soon the blame game will begin. However, from my perspective there is a certain inevitability about the outcome, which rests on long-term economic and political factors that are rarely raised by most commentators. After a political tour to Greece two years ago, I blogged about these issues here, here and here. 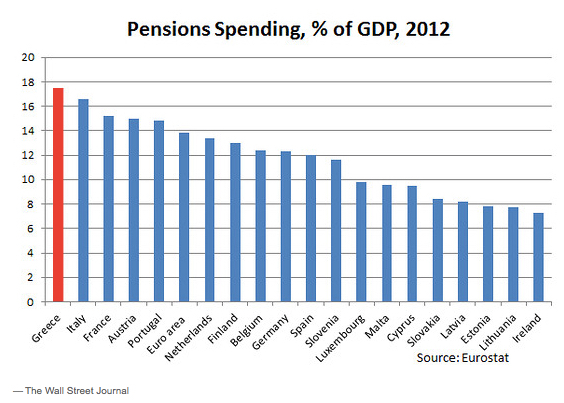 Front and centre of the factors driving Greece toward its current predicament is the country’s terrible demographics. 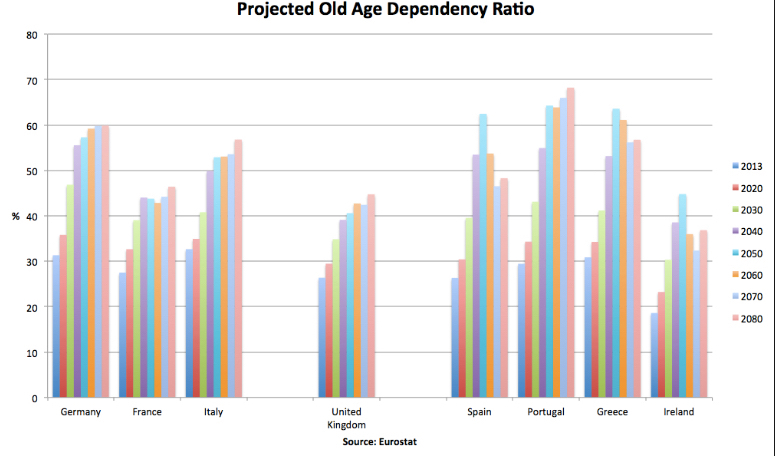 Let’s look at its current and projected old-age dependency rate, which I took from Eurostat. Currently, the ratio of the elderly (65+) to working age (15-64) is 1:3. 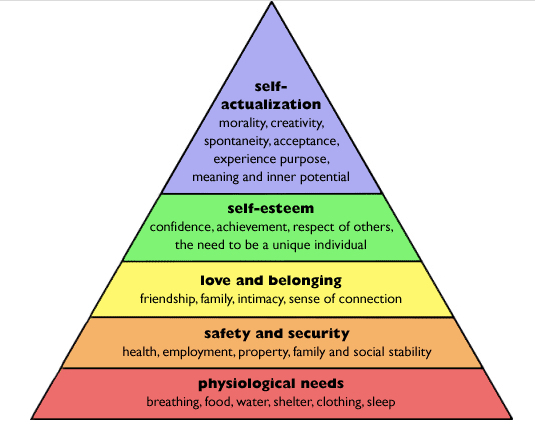 However, this ratio is rapidly moving toward 1:2 (click for larger image). 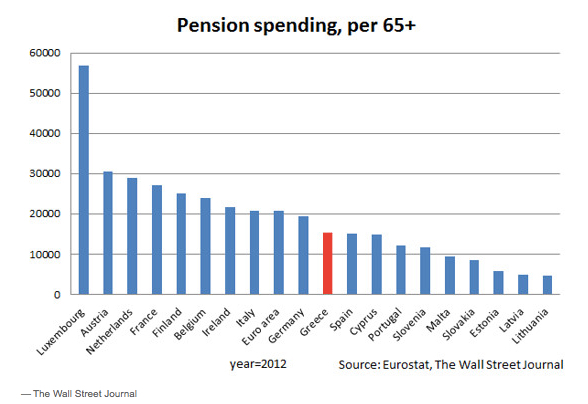 Not surprisingly, such demographics are putting a huge burden on the state with respect to pensions. Even the right-of-centre Wall Street Journal goes beyond the stereotype of greedy Greeks in recognising this fact (source: here). So while the aggregate Greek pension burden is very high in a European context when compared with GDP, it is not so high when we put pension spending on a per person basis. With demographics like this, the only way a country can maintain living standards is through securing high productivity growth. And to do that, in a global economy, a country needs a comparative advantage in industries that exhibit high productivity growth. Unfortunately, since entering the euro at what proved to be the wrong rate, Greek growth has been concentrated on just a few industries such as tourism, real estate, shipping services and infrastructure projects benefitting from EU regional development funding. Many of these industries got savaged in the wake of 2008/09 financial crisis, and those that have remained reasonably robust, such as tourism, are not great engines of productivity growth. As Japan amply demonstrates, when a country enters a steep demographic transition, it is very difficult to secure high rates of economic growth. But that doesn’t mean that you can’t maintain full employment, social cohesion and well-being. 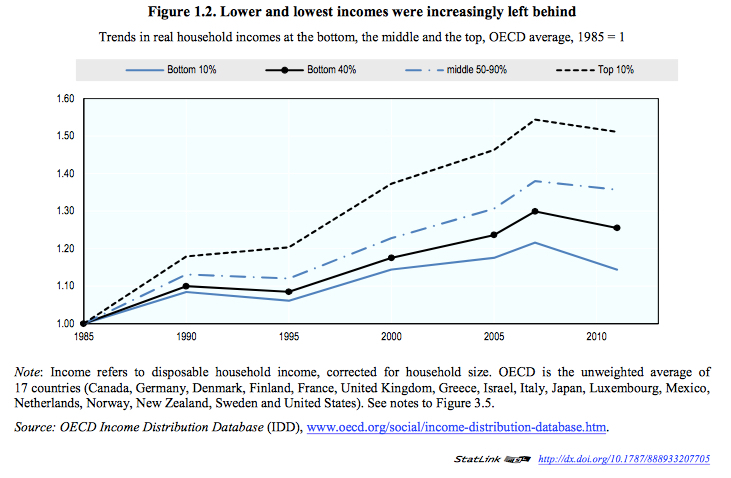 Japan has partially done this through accepting declines in real wages and a depreciation of its currency. Indeed, the Japanese middle class tourist, once king of Bloomingdales and Harrods in the 1980s, is now relegated to factory outlets. If you are struggling with adverse demographics and poor competitiveness, the last thing a country needs is for its actual economic output to be substantially below its potential output. But this is what you get if you implement a vicious policy of austerity within the context of a lack of effective demand and a fixed exchange rate. Far better is to adjust prices through maintaining a flexible exchange rate and allowing a modicum of inflation. And the only way for this to occur is for Greece to leave the euro and return to a freely floating drachma. I have just finished reading Dylan Evans’ book “The Utopia Experiment“, which chronicles the author’s doomed attempt to found a self-sufficient community in rural Scotland as a post-collapse prototype for others to learn from. It is always interesting to find a hidden back story about one of the authors who sit on my book shelf–and boy does Evans have a bizarre back story. Evans is an LSE-trained philosopher and scholar of risk, robotics, artificial intelligence and evolutionary psychology (after many a wayward turn). I already own his book “Risk Intelligence”, which deals with many of the issues I confront in this blog, particularly ‘decision-making under uncertainty’. Unknown to me, Evans’ interest in risk, combined with his own personal demons, had previously led to a decision to opt out of conventional society, which in turn led to a complete nervous breakdown. How likely do you think it is that something like the imaginary scenario you are acting out in Scotland might really come to pass in the next ten years? I thought a bit longer, and finally declared that I thought that the chance of such a thing happening within the next ten years was about 50 per cent. Nick looked shocked. Not even the most pessimistic scientists thought things were that bad…. ….the precision that Nick had demanded of me forced me to own up to my error in a way that vagueness never would. It betrayed the extent to which what had started out in my mind as an exercise in collaborative fiction had already become an insurance policy against a global disaster that I was increasingly convinced was imminent. Later he frames this decision as more psychological rather than intellectual. A predisposition toward depression coupled with a generalized angst at living within large corporate structures results in a rejection of his existing social and institutional ties. The irony here, as he later admits, is that for one so psychologically fragile discarding structure is about the worst thing he could have done mental health-wise. Moreover, ever the contrarian, Evans comes to question his own beliefs more rigorously the more advanced the experiment becomes. Intellectually, his certainty is lost and without that comforting narrative ‘Utopia’ become less a personal lifeboat but more of a rip tide dragging him below the waves. So are there any wider lessons here? I think there are many. First, as behavioural economics teaches us so well, humans and not what the economist Richard Thaler calls ‘Econs’; that is, emotionless calculating machines as opposed to humans. 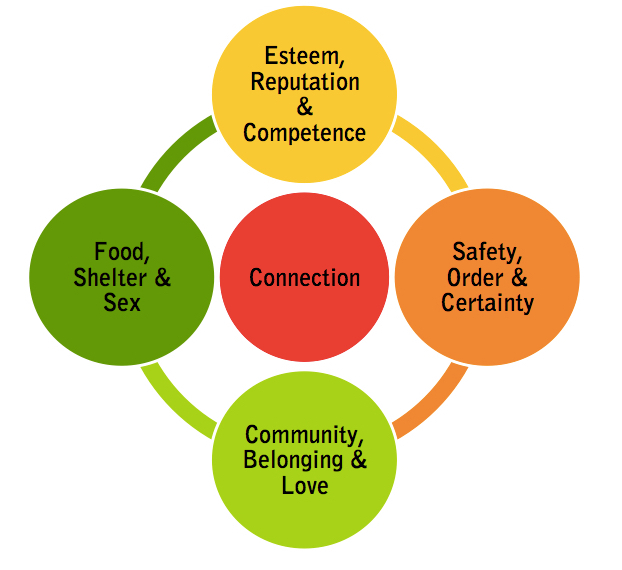 We can only perceive risk and uncertainty within an emotional framework. Humans have an optimism bias partly as an evolutionary means to advertise positive traits that allow us to mate and flourish but partly just to keep us sane. Examining the downside is painful and can lead to isolation, rejection and depression. Yet perhaps there are those of us who can maintain contrarianism without falling apart. Evans documents how the participants in ‘Utopia’ rapidly progress from viewing the commune as an experiment to one of preparation for real collapse. They need a narrative to inoculate themselves from the outside world. Yet after a time, Evans starts to question all the collapse narratives that the commune volunteers espouse, falls into depression and is eventually replaced as leader by an early volunteer called Agric. What Agric offers to the remaining volunteers is a narrative of certainty, which Evans could no longer offer. Further, this is a narrative that is immune to any counter-argument since it rests upon an irrefutable theory. Part of the reason why Agric was so dismissive of any suggestion that civilisation might not be about to collapse was the fact that he had a powerful theory. He was in the grip of Malthus, like many before him. Malthus had shown that population growth must always outstrip food supply, right? He had proved it. The idea that our civilisation might not only survive global warming but also continue to grow richer had appalled me, and this was perhaps why I had believed so ardently that it would collapse. I had wanted it to. Agric still did. At this point it would be easy to laugh at the ‘Utopia’ pioneers, painting them as New Age fools. But not so fast. Evans’ story shows how hard it is to disentangle the dispassionate from the emotional when it comes to risk and uncertainty, particularly when it comes to tail risk. But this cuts both ways. Let’s assign a 1% probability to collapse rather than Evans’ 50% and let’s push out the horizon to five decades rather than one. We are now entering the territory of intellectual respectability. The kind of probabilities that former Astronomer Royal Martin Rees sets out in his book “Our Final Century“. 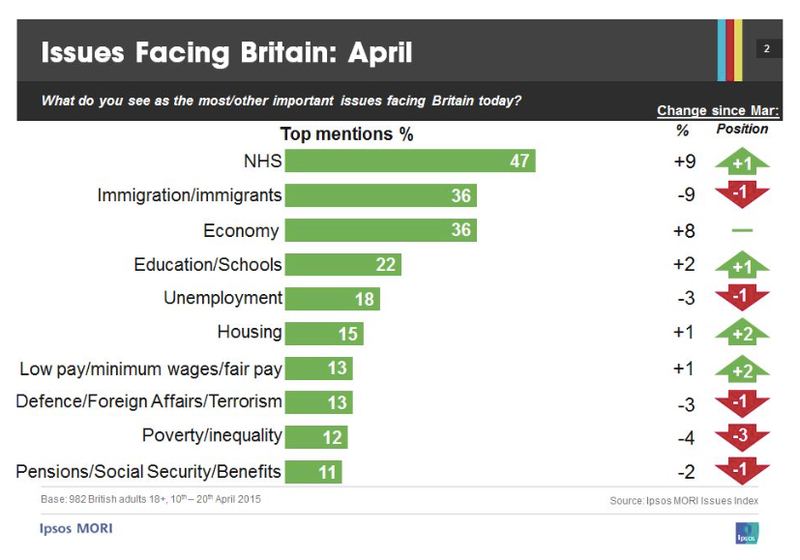 Yet the vast majority of us are repelled at discussing such negative scenarios. 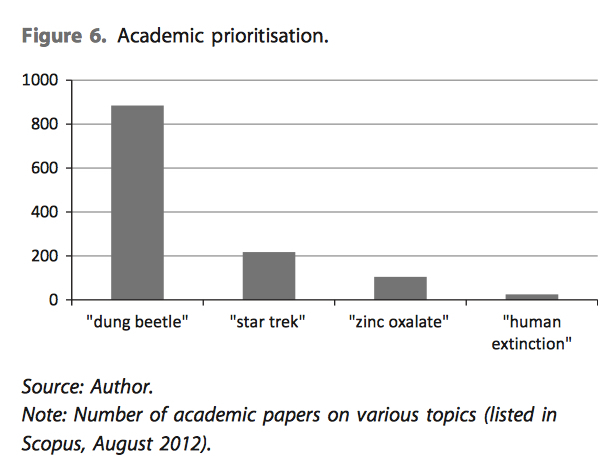 Nick Bostrom points out that the academic literature is many times richer when it comes to publishing papers on dung beetles or Star Trek than it is to considering existential threats to humanity (here). I propose that to seriously consider those dark-side scenarios you need either 1) immense psychological detachment and resilience or 2) no psychological detachment at all (a joyful embrace of the collapse narrative). In short, psychology-wise you need to be built differently from the vast majority. Nonetheless, some true contrarians do exist in a variety of fields, for example, finance, and walk a fine line between delusion and perception. It is such people who populate Gregory Zuckerman’s book “The Greatest Trade Ever” which retells the story of five individuals who made their fortunes from the collapse of Lehman Brothers and the onset of the Great Recession. These are not Thaler’s dispassionate, calculating ‘Econs’ devoid of emotion. These are five individuals with their own rather peculiar character quirks who are naturally uncomfortable with both the status quo and the institutions that support the status quo. In this particular case, they emerge from Zuckerman’s book as prescient heroes. Of course, we never hear of the thousands of similar individuals whose backs are broken on the wheel of markets that go the wrong way. Perhaps our differing reactions to upside and downside risk is nature’s way of hedging its bets. A few of us are comfortable operating in the super optimistic probability tail of upside risk and fewer still like Agric like to wallow in the pessimistic tail of downside risk. From an evolutionary perspective, most of the tail risk jockeys end up as road kill. But things do change, and perhaps a maladaptive mutation will suddenly becomes a vital survival trait. Those Agric-like fellows who believe they know the future will be the equivalent of bacteria on a petri dish that survive a dose of penicillin. A mutation that may previously have been an impediment becomes a life-saver as circumstances change. We each have our own view of rationality, but it is our emotional state that keeps us sane when seeing the world. Don’t get me wrong: I am no post-modern relativist. For example, I think there does exist an objective assessment of the likelihood that the globe will experience extreme climate change leading to economic collapse by end century (and a non-negligible one at that). This is certainly not enough risk to make me run off to the wilds of Scotland, but it is a risk nevertheless. But I think that only some people can psychologically live with such a fact. Most can’t. The dominant narrative is: let’s pretend that climate change doesn’t exist as a factor in our or our children’s lives and carry on regardless. Dylan Evans’ story may perhaps be one of the delusion of a few, but humanity’s inability to tackle climate change is a story of the delusion of the many. So let’s not laugh too long at ‘Utopia’.